Orchid products are handcrafted and designed for maximum flavor and overall enjoyment. Our proven processes and passion for what we do carries through into our products. The end result is an unparalleled experience for new and practiced cannabis users alike. With just the right amount of fruitiness and a heavy-hitting cerebral high that has a tendency to melt you into a sweet puddle of sedated chill. A delightful and tasty profile that is known to delivery heavy and tranquilizing effects, leaving you giggly and ready for a good night’s rest. 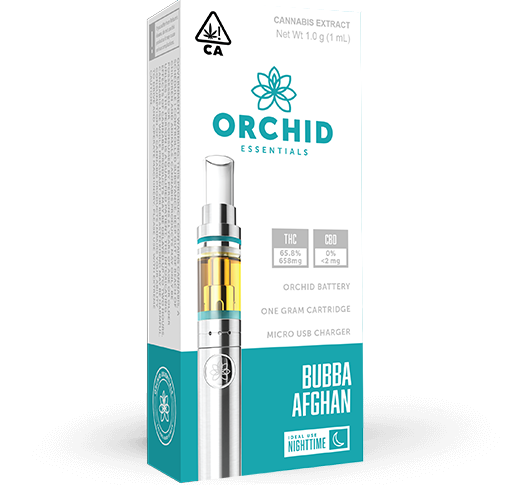 Packed with heavy sedative effects, Bubba Afghan can come on slow but will leave you ready for a great night of lounging around and sleeping soundly. At Orchid, we are strong believers that the science behind our manufacturing process is what helps us deliver amazingly pure products with high levels of terpenes in an effective delivery system. Don't take our word for it–try it for yourself. The Feel Good is Near™. Orchid's BHO distillate is extracted from locally farmed, pesticide-free material. We work with local farmers in each state we manufacture in and support local jobs and communities. Our cutting edge BHO extraction and distillation process with the isolation and re-introduction of terpenes allows us to have superior taste and efficacy with an amazing terpene profile. At Orchid, we use natural terpenes from the original strain, and our inspired flavors have added terpenes from other fruits and herbs delivering superior taste and efficacy. Orchid's revolutionary design was tested and built to deliver the best user experience and ultimate satisfaction. Orchid never uses PG, PEG, VG, or coconut oil, all of which are known to be harmful when vaporized. Everything we create is natural and designed for the best user experience. Our vaporized products, concentrates, drinks, and CBD line are the highest quality products available on the market today, and will continue to be the standard due to our constant innovation and quality standards. Handcrafted to be safe, effective, enjoyable, and to deliver the best user experience.